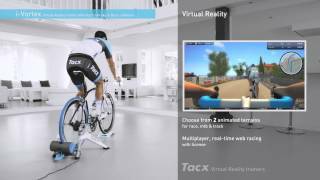 The Tacx Vortex Smart trainer is a Tacx's interactive trainer, for targeted and serious training. Use the trainer without or without your PC or laptop, you can connect the Vortex quickly and easily to the Tacx Cycling apps. This means you can manually tweak your training session whilst cycling; slope, power output or heart rate programmes. A multitude of other software programmes are available through your Tacx Turbo Trainer. On Tacx trainers this is called FE-C, which enables you to use your favourite software be it: BKOOL, ZWIFT, Virtuial Training or many others. The interactive world allows you to virtually ride through some of the toughest conditions, conquer some of the hardest climbs and descend some of the scariest mountains. The route is displayed on your laptop, computer or TV and the trainer communicates wirelessly. Thanks to the electro brake a resistance can be set that you also experience on the road or in a climb. The software that the Vortex uses is a little bit more basic than that of the Busido or the IRONMAN. The simplified software still allows you to train in a scientific way but with not as many readings as the more powerful software. It contains two beautifully designed Virtual Reality terrains: the Valeggio road terrain in Italy and a Velodrome, however you do have the possibility of cycling in the Tacx films. Making your training a little more fun, adventurous and now with the GPS outdoor training, you can record rides which can be completely relived at home. interact with people all over the world, with Multiplayer you can compete online against real opponents. This requires a license. With the Basic software and a Multiplayer license you can ride in the VR against up to ten real opponents.The Vortex is the perfect option for enthusiastic cyclists who want to prepare themselves at home for big tours or races. Easy to use, everybody can start at once.